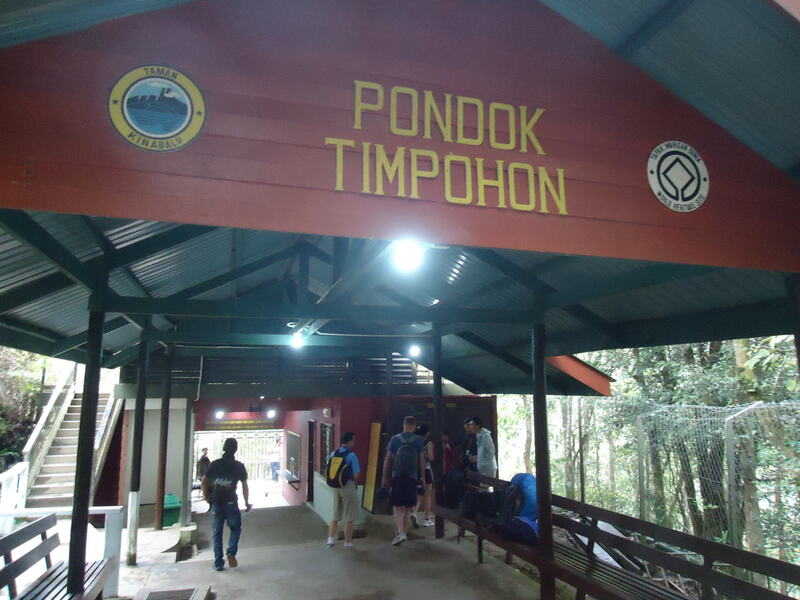 Timpohon Gate marks the official start of the Mount Kinabalu hike in Malaysia. 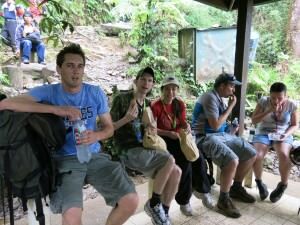 And so to Day 1 Part 3 of the epic Mount Kinabalu hike in Malaysian Borneo. Having booked the tour, paid for it and arrived at Kinabalu National Park we then arrived by minibus to the entrance at Timpohon Gate. 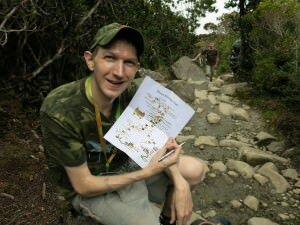 Signing the sheets at Timpohon Gate on the Mount Kinabalu hike. 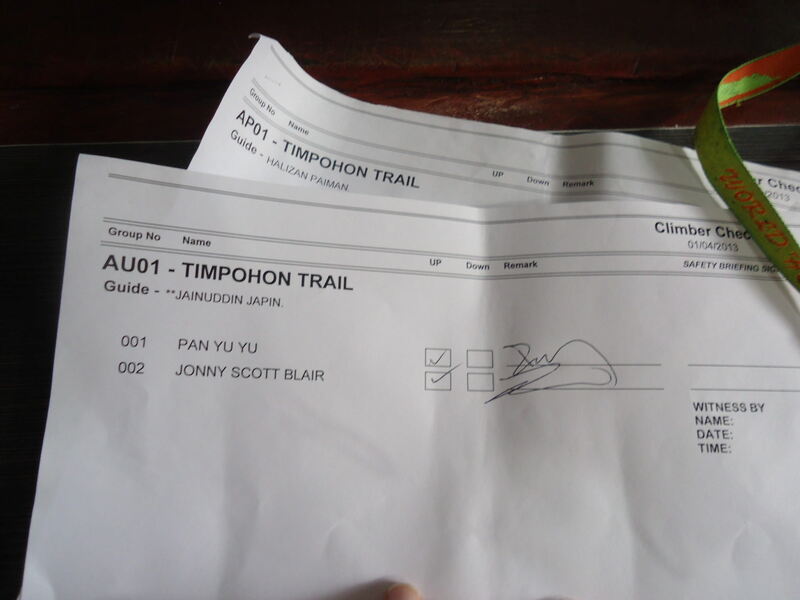 Anybody who has hiked Mount Kinabalu will know the hike starts at Timpohon Gate. You sign your names there to say you have started a hike and your guide accompanies you on the hike. 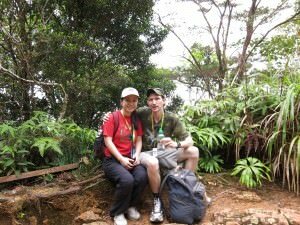 My girlfriend Panny and I about to start the hike up Mount Kinabalu! Once you’re at the entrance, pose and get your “starting” photos taken and off you go! 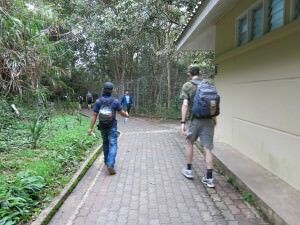 The most surprising thing for me was that the first part of the hike is downhill! 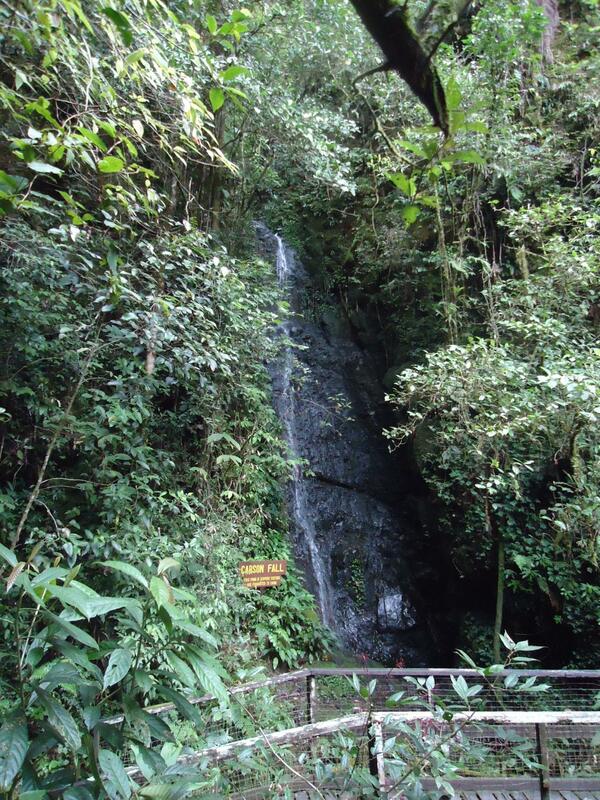 But only the first 10 minutes or so until you arrive at the only waterfall on the hike – Carson’s Falls. Starting the hike – it’s a downward walk to start with down to Carson’s Falls. It’s nothing to write home about (the waterfall), but try and get the first couple of kilometres out of the way nice and early. Trust me – they are an easy stroll. The start of the hike is easy terrain like this – get it over and done with quickly if you can! 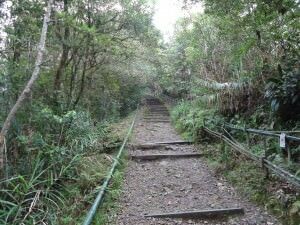 The terrain is easy, the ascent is not steep and the view is mostly of forest. Up until the 3 kilometre mark that is. When we did it was also misty. 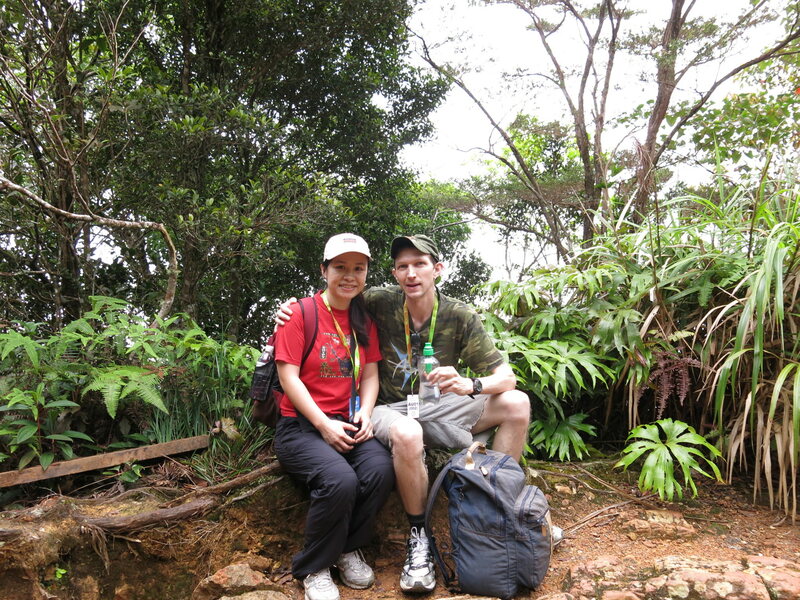 Having a rest and a water break on the first part of the hike! 9:45am – Timpohon Gate. Where you sign in and officially start the hike. Signing in and onto the hike at Timpohon Gate! 9:54am – Carson Falls (500m). 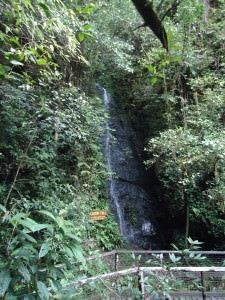 It’s a small waterfall at the bottom of the hill. 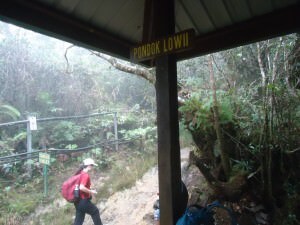 10:08am – Pondok Kandis Shelter (1km). This is 2,039 metres above sea level. 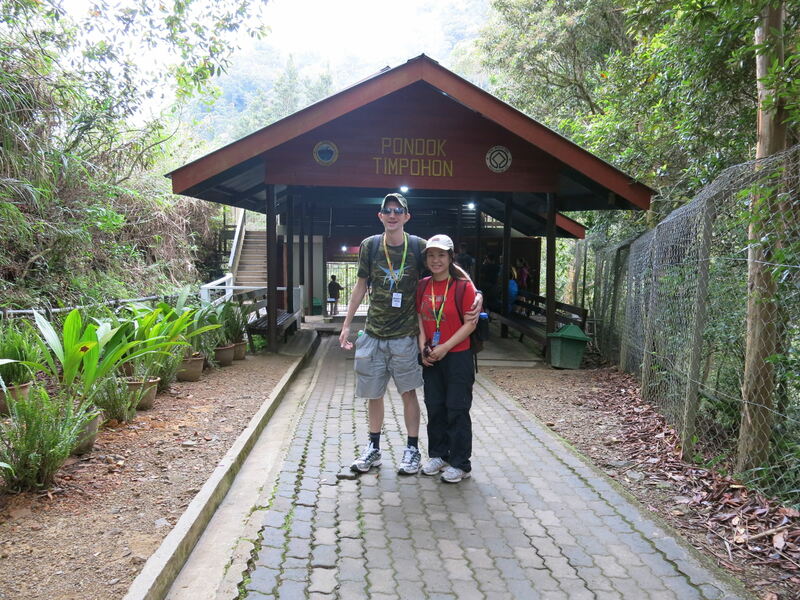 At the 1kilometre mark at Pondok Kandis Shelter. 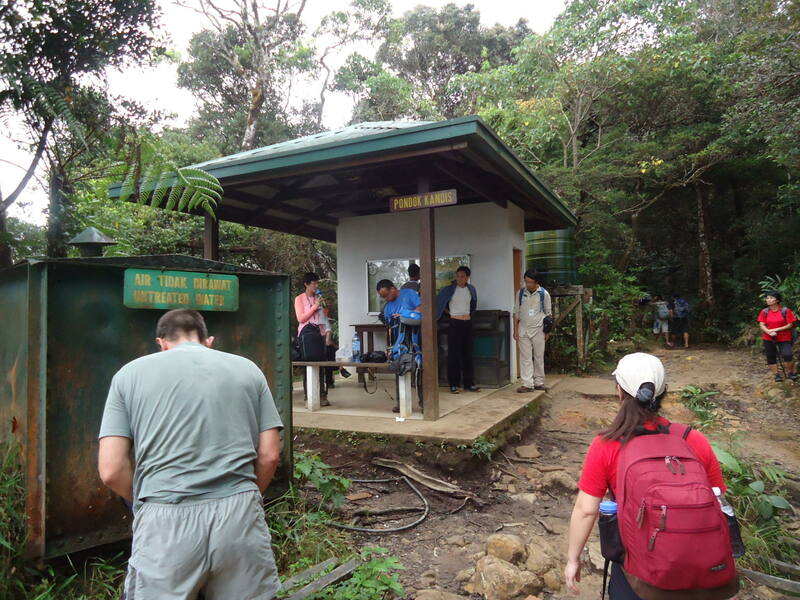 10:24am – Pondok Ubah Shelter (1.5km). This small shelter is 2,081 metres above sea level. We just did a water stop. 11:02am – Pondok Lowii Shelter (2.5km) – At this point we were 2,350 metres above sea level. 11:40 to 12 noon – Mempening Shelter (3.2km) – We arrived at the Mempening Shelter and sat down, deciding on an early lunch. Chilling out on the hike to update my travel notes! The life of a nomadic travel blogger! 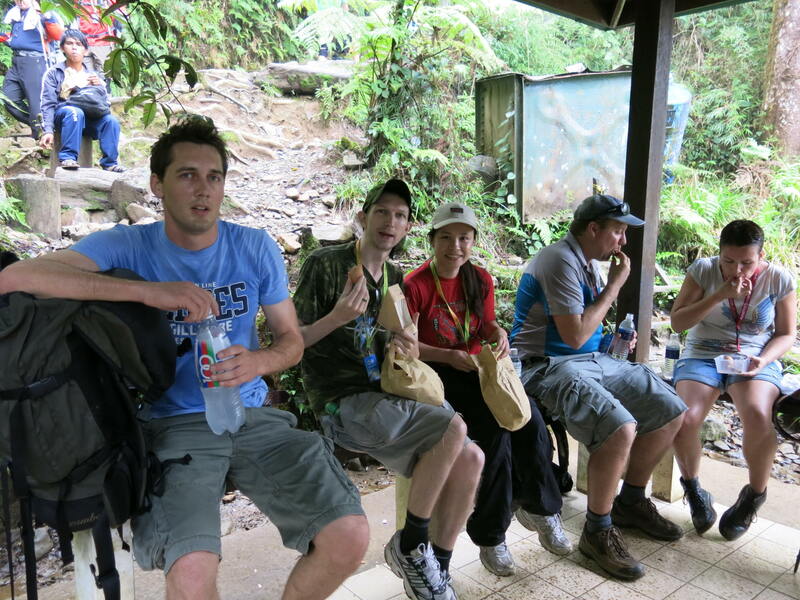 Lunchtime was at Pondok Mempening Shelter, time to revitalise before the last upward part of the day. 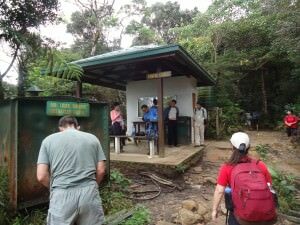 12:29 am – We arrived at Layang Shelter (4km) and had covered more than 2/3 of our hike for the day.